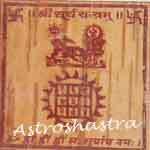 Vastu Yantra to appease Vastu Devta and remove Vastudosh	ill-effects from place of work/residence. Vastu is a science which deals with the creation of harmonius energy field in a structure. Vastu Dosha is a projected flaw or deficency in the known charcterstics of eight directions. These directions have been endowed with qualities based on a classification sourced from the Panch-mahabhutas. Basically it is all about interaction of various forms of energy in a structure. 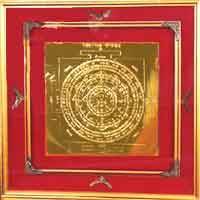 This yantra helps create a conducive atmosphere in a structure. A positive atomsphere brings out the best in us. Our mind is calm and relaced and the body feels healthy and strong. The atmosphere makes us think positively, makes our approach positive and hence positive results flows. It is a to appease Vastu Devta and to activate the Vastu Purush and balance energies of the Place. It combats all the bad influences & ill-effects of Vaastu faults existing in one's home or office. Mostly, there are certain inherent faults about direction, location, situation of a building, situation of rooms etc, which may not be easily curable or rectifiable. It not only helps to cure all inherent Vaastu faults and remove their ill-effects, but also generates the positive & benefic effects of Vaastu. 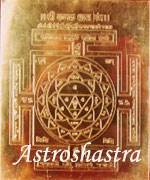 Astroshastra also provide free Vastu Check or test online for your home , office or factory. This can be buried under the ground before or after construction, with due rituals, or installed at the 'Puja' room, and worshipped. 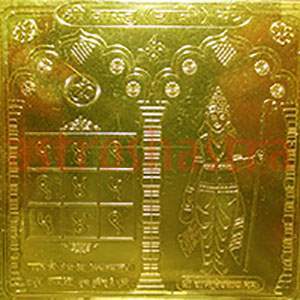 Vastu Dosh nivaran yantra is the most effective remedy for vastu correction without demolition. 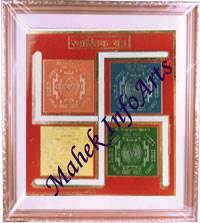 Silver Vastu Purush Yantra 4" X 4"